Elections should be about ideological differences. Liberals and conservatives, or Democrats and Republicans, tend to have different worldviews. Most people agree on a few broad and fundamental premises. We just do not agree on how to get there. This election cycle is different. This is a battle between the first female nominee of a major political party and the first nominee of a major political party who lacks any time in public office or military experience. This is a battle between equality versus discrimination. About tolerance versus intolerance. The importance of Hillary Clinton's historic nomination as the first nominee of a major political party is underscored by the distressingly misogynistic comments coming from Donald J. Trump. Unfortunately, in this historic election, the outcome will be decided by voters who are weighing in against one of the two leading candidates. As we have seen in the conventions, the candidates are not only trying to energize their supporters and get them to the polls, they are trying to convince undecided voters to vote against their opponent. Philander Castile was pulled over for a broken tail-light and shot while he reached for his registration. While there has already been much discussion of the shooting, one point is missing from the story: the police stop was likely a pretext to engage in drug interdiction. Now I am not suggesting that Castile was stopped because he was black. Nor am I suggesting the contrary—that he was *not* stopped because he was black. What I am suggesting is that the primary purpose of the stop was *not* to tell him about his busted tail-light—an admirable act of beneficence on the part of the police officer—but to search Castile’s car for drugs. And it is this aspect of the encounter—a police officer, looking for drugs, and finding an armed individual inside the car, that inevitably produced the deadly result. On Nov. 8, 2016, California voters will choose between two competing death penalty initiatives: Prop 62 ends capital punishment and saves California taxpayers $1.5 billion over the next 10 years, while the other measure, Prop 66, doubles down on the state’s costly, failed system, spending millions more in an effort to speed up executions. The state has spent roughly $5 billion over the last 40 years on a system that has produced no more than 13 executions. Supporters of Prop 62, known as the Justice That Works Act, say it is too costly, it does not deter crime, it risks executing innocent people, it is not evenly applied racially or geographically, and it is fundamentally a failed system that cannot be repaired. They say its time to end the death penalty because the system has long been dysfunctional and is now broken beyond repair. They also argue that ending the death penalty will prevent the state from ever executing anyone who is actually innocent of the crimes for which they were convicted. Prop 62 is retroactive and will convert the death sentences of the 747 inmates on death row to life without the possibility of parole and increase to 60% the share of wages earned while working in prison that are dedicated to victim restitution orders. By contrast, the Death Penalty Reform and Savings Act of 2016, Prop 66, claims the system can be fixed and proposes to implement various amendments to state law aimed at speeding up the judicial review process and the rate of executions, including suggested time frames and limitations on direct appeal and habeas corpus proceedings, changing the process for appointment of to appoint counsel in direct appeals and habeas corpus petition proceedings, shifting initial jurisdiction for habeas corpus petitions, and making various other changes to the laws and procedures that would ease regulations surrounding the lethal injection protocols developed and employed by the California Department of Corrections and Rehabilitation (CDCR). These proposed changes will increase state costs by tens of millions of dollars annually, with the fiscal impact of such costs being unknown in the longer run. Yesterday’s decision in Fisher v. University of Texas at Austin marks the first time Justice Anthony Kennedy has ruled in favor of a racial affirmative action policy in the twenty-eight years he has served on the Supreme Court. Unwilling to sound the death knell on racial affirmative action in higher education, Kennedy ventured down a path he had never taken before. He upheld the race-conscious component of the University of Texas at Austin’s admissions policy as satisfying the stringent strict-scrutiny standard of review. Instead of siding with rejected white applicant Abigail Fisher or ruling that affirmative action is per se unconstitutional as Fisher’s lawyers contended, Kennedy upheld the policy Fisher challenged as unconstitutional despite an oft-articulated constitutional aversion to race consciousness. Kimberly West-Faulcon, the James P. Bradley Chair in Constitutional Law at Loyola Law School in Los Angeles, said Kennedy’s decision represents a “significant departure” from his previous decisions in affirmative action cases.“This is momentous,” West-Faulcon said. “Justice Kennedy has finally found a racial affirmative action policy that he was willing to endorse.“This is a significant departure from every racial affirmative action case Justice Kennedy has decided to date,” West-Faulcon continued, referring to Kennedy’s votes against affirmative action policies in two higher education cases — Grutter and Gratz — as well as other cases. POLITICAL CORRUPTION: McDonnell v. U.S.
"It allows for a great deal of activity that really sidelines the average person who can't give a Rolex, a Ferrari or throw a wedding for someone," said Loyola Law School professor Jessica Levinson. "It essentially acknowledges that business as usual in political means money talks really loudly." Professor Allan Ides, the Christopher N. May Professor of Law and a former clerk to U.S. Supreme Court Associate Justice Byron White, deconstructed how the alterered Supreme Court composition affected case outcomes. Professor Allan Ides discusses the effects of Associate Justice Antonin Scalia’s death on the Supreme Court at it wraps up its 2015 term. “For run of the mill cases this is having no effect, but the high-profile cases — Friedrichs, the contraceptive case, immigration — it has had an impact and you can see it where the court has been unable to resolve the case or tried to find some gimmick to send it back to the lower court,” Allan Ides, a professor of law at Loyola Law School in Los Angeles, said about the impact of a short-handed court." 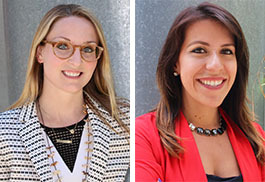 The co-directors of the Loyola Immigrant Justice Clinic – alumnae Marissa Montes and Emily Robinson – were go-to sources of commentary on the Supreme Court’s opinion in U.S. v. Texas, which struck down President Obama’s executive action on immigration, Deferred Action for Parents of Americans (DAPA). Marissa Montes, Co-Director of Loyola Law School, Los Angeles’ Immigrant Justice Clinic, joins Morning Edition to discuss the Supreme Court's tie vote, which blocked an attempt to help millions of unauthorized immigrant families. The case goes back to the court of a conservative federal judge in Texas. "We would be naive to think he is going to side with the immigrant advocates in this country who want protections," Emily Robinson, co-director of the Loyola Immigrant Justice Clinic in Los Angeles, said in an interview Friday. Miller's commentary was featured on SCOTUSblog. Another brief from 28 legal scholars, dated Monday, focused on what the professors described as a problem with the Ninth Circuit’s First Amendment analysis. The 28 law professors are represented by Eugene Volokh of the UCLA School of Law and Jennifer E. Rothman of Loyola Law School, Los Angeles. Professor Paul T. Hayden's book, "The Law of Torts," is cited in the U.S. Supreme Court's opinion turning on when liability arises under the False Claims Act. We need not resolve whether all claims for payment implicitly represent that the billing party is legally entitled to payment. The claims in this case do more than merely demand payment. They fall squarely within the rule that half-truths—representations that state the truth only so far as it goes, while omitting critical qualifying information—can be actionable misrepresentations. A classic example of an actionable half-truth in contract law is the seller who reveals that there may be two new roads near a property he is selling, but fails to disclose that a third potential road might bisect the property. See Junius Constr. Co. v. Cohen, 257 N. Y. 393, 400, 178 N. E. 672, 674 (1931) (Cardozo, J.). “The enumeration of two streets, described as unopened but projected, was a tacit representation that the land to be conveyed was subject to no others, and certainly subject to no others materially affecting the value of the purchase.” Ibid. Likewise, an applicant for an adjunct position at a local college makes an actionable misrepresentation when his resume lists prior jobs and then retirement, but fails to disclose that his “retirement” was a prison stint for perpetrating a $12 million bank fraud. See 3 D. Dobbs, P. Hayden, & H. Bublick, Law of Torts §682, pp. 702–703, and n. 14 (2d ed. 2011) (citing Sarvis v. Vermont State Colleges, 172 Vt. 76, 78, 80–82, 772 A. 2d 494, 496, 497–499 (2001)). Thanks to the powers at Prawsfblawg for inviting me back. I'm a law professor at Loyola Law School, Los Angeles. I always appreciate the opportunity to place my nascent thoughts in the public forum, and see what interests folks. For the most part, I'll blog about criminal procedure in general, and in particular policing. But given the date, I thought something else might be more appropriate. I’m Scottish. Given the current temporal proximity of Brexit and the Fourth of July, in which Americans celebrate their revolting forebear’s legally irrelevant secession statement, I'll impart one thought on nationalism. We might think that nationalism is a unilateral affair: it states “I assert my independent status as Scottish/English/American/etc.” But nationalism is, in fact, a bilateral or multilateral affair: in asserting your American identity, you rejected your British identity. It is possible to have multiple identities—Scottish and British and European. But multiplicity sits uncomfortably with nationalism. Even if Scots want to be independent *within Europe*, Scottish nationalists want to be *not-British* within Europe. And for Scottish nationalists, Europe is not an independent national identity: it is a subsidiary part of the Scottish identity. Scotland, the Scottish nationalists assert, is a European country, not limited in its projects to the British Isles (and maybe even not oriented in its projects to the British Isles).